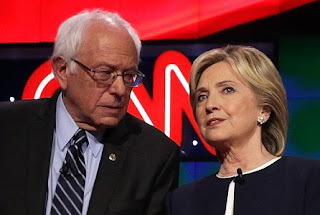 This year, in the Democratic primary, we have Hillary 2.0, “It’s My Turn” versus Bernie Sanders, whose “Enough is Enough” campaign has excited people who normally don’t think about politics. Clinton and Sanders both offer compelling cases. 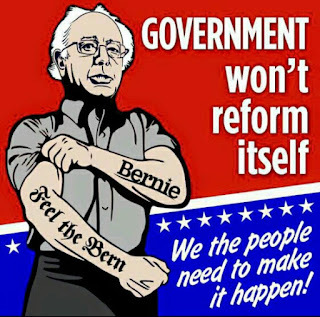 Clinton brings experience and pragmatism to her campaign while Sanders wants a more transforming government. Since they both agree on the issues roughly 90% of the time, it is their approach to how to best run the executive branch will decide in the end for most voters who they will support. As for Psychosomatic Wit, I believe Bernie’s approach to be the most compelling and serves the best interest for this season and for the future of this country. Let me lay out my case. I originally was in the Clinton camp. I didn't think that anyone should even bother to challenge her in the primary. As we all have heard before, many believe that Hillary is the most qualified candidate that has ever run for president. She did meaningful work while being associated with the executive branch as first lady and received hands on experience of government from the legislative branch side of it as a senator from New York. She has also spent four years as Obama’s secretary of state which is probably the most impressive qualification she has. Many may argue that she didn’t do anything significant, but she certainly was busy cleaning up a lot of diplomatic messes in the Middle East which is a result of a broad military presence there. Despite the right wing talking points that the US has a worst reputation around the world under Obama, the facts do not back them up. According to the three polls I could find (BBC Polling, Pew, and Gallup), the US has improved its standing around the world compared to the Bush administration. Clinton can sincerely take credit for a big part of that. Both realize that we have farther to go in providing health care. Sanders wants to transform our healthcare system to something similar to the rest of world - a single payer, everyone is covered system he calls Medicare for all - borrowing from the popular system already covering senior citizens and the disabled. Clinton wants to build on ObamaCare, (the Affordable Care Act) that President Obama worked hard to pass that is the centerpiece of his presidential legacy. The third leg of bridging the gap between the rich and the middle and working class has to do with accessibility of education. Sanders believes that public education should increase from K-12, to K-16. He claims that a Bachelor’s degree today has about the same bargaining power for employment as a high school diploma fifty years ago. He claims that in order to stay competitive and give the middle and working class a chance to keep up with educational requirements for most gainful employment, the time has come to revise the extent of public education bridge the educational gap. Clinton wants to take that notion as far as an associate's degree (2 year) at a community college. This is concept that was introduced by Obama. She also wants to make borrowing money for tuition more affordable. Clinton’s main arguments about why she should be elected over Sanders is three-fold. One is her experienced which I have already touched on. The second reason is her electability. She believes that she is the only one that has a chance defeating the Republican in the fall. Finally, and the reason she emphasizes the most, is that she is the only one that can get her agenda passed through Congress. When analyzing these and other arguments, PW has decided to endorse Bernie Sanders. In addressing her experience, it is true that, no matter how you slice it, Clinton has more qualifications based on experience. Although Sanders has served in the legislature longer, Clinton’s experience as Secretary of State cannot be matched by Sanders or anyone else. However, if this was the main qualification to hold the office of president in this country, we would have a number of former secretaries of state holding the office throughout history. Sanders argues that his judgment is more sound than Clinton’s. He points to his opposition to the Iraq war and the numerous trade deals, such as NAFTA that he opposed while Hillary supported them. Still, judgment aside, it is hard to minimize her experience. Clinton argues that because of her experience, she will be ready on Day 1 to deal with anything that arises on the foreign policy side. The saving grace for Sanders, in addition to his judgment, is that starting in November, the president-elect, while putting a team together is kept apprised of all security situations. As long as the team is good, the foreign policy is good and Sanders will have the opportunity to use his judgment based on the information he is given. Clinton claims the edge on electability but the facts really don't bear that out. The right wing absolutely despises her. She has had over 20 years head start acquiring that level of contempt compared to Bernie, a relative newcomer on the national scene. Unfortunately for Clinton is that hate spills over to mainstream America because of the success the Conservative Entertainment Complex (CEC) of pushing their views. Fox News and AM radio have butchered Hillary for years and some of the metrics associated with her establish this. She is running a high deficit on trust issues as the CEC will not let her email issues and other scandals disappear from the public eye. In addition, the most recent head-to-head polls for the general election show Sanders in a much better position to win in the fall than Clinton. In polling reports provided by Real Clear Politics, Clinton narrowly defeats Trump but loses to the rest of the field. In the same polling, Sanders beats the entire field. When figured on average, Hillary loses in the fall no matter who her opponent is, but Sanders beats the entire field by an average of 9 percentage points. In examining which candidate can push an agenda through Congress, Bernie still makes the most sense. Hillary is running on a pragmatic platform. She keeps saying that she won’t make promises that she knows she can’t keep. What that means, is that she is the candidate of increments. She knows we need a universal healthcare single payer system in this country, but she doesn't want to push it, so she says that she just wants to build upon ObamaCare which still gives insurance companies control over our health care. 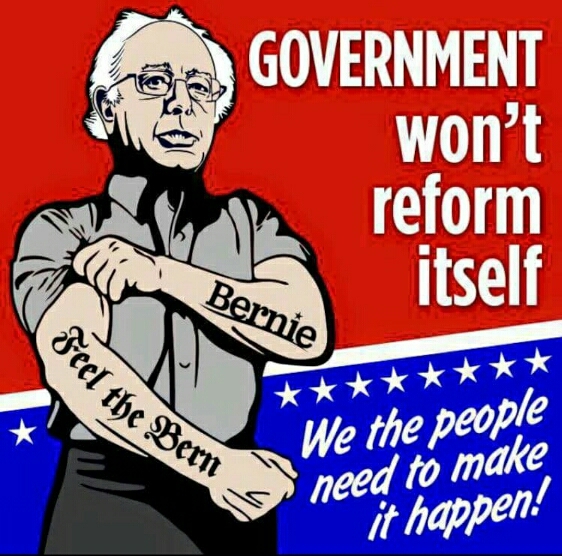 Bernie wants a revolution. He wants to take the populist capital that he has and continues to acquire and put pressure on the system. That is what a revolution is all about - championing the grass roots with the threat of “throwing the rascals out” if they do not bend to the will of the people. A revolution will have bigger coattails and have a better chance bringing lower level democrats into office with the huge excitement and turnout it should bring. Bernie knows that with the big money in campaigns, he isn't going to get the great things passed. That is why it is his number one objective to reform campaign financing. If we can’t get money out of politics, it really doesn't matter who wins, does it? So, yes Bernie Sanders wants to do great things and Hillary wants to be pragmatic. To borrow a sports metaphor, Hillary might be a good game manager, but Bernie is a play maker. The time has come to stop throwing a few crumbs to the masses in an unseemly attempt at pacification while preserving a system of big money corruption that flies in the face of our very democratic national identity. The Republican party is not going to work with ANY Democratic president. We have seen that over the past seven years and the election of Hillary Clinton will not change that. It will take a revolution to change the government from one of stalemate and stagnation to one of progress. Because of this, Psychosomatic Wit is forced to shout, “Go big, or go home!” And in that spirit, PW whole-heartedly endorses Senator Bernie Sanders for the Democratic nomination for president. I have seen that look before. He is completely smitten by her! 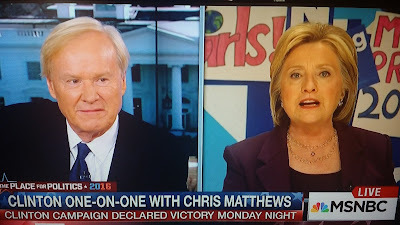 There was an interview between Chris Matthews and Hillary Clinton after the Iowa Caucuses on the following day. It was the most lopsided interview I have seen in some time. I thought I was going to see Matthews blow her kisses. Let me paraphrase the interview for you. Matthews: Hillary you are great! Not like that looney tune, Bernie Sanders. Hillary: Yes, I know. And you are right, there is a lunatic running for the nomination against me but I won't name names. Matthews: How does that guy think he is going to win? He isn't as great as you. He doesn't smell as good as you do, either. Hillary: I don't know why anyone would listen to him. Everyone knows that the status quo is what is needed. Hillary: Agreed. Bold ideas will never work. He won't get anything passed by Congress. The Republicans will block everything. It is such a good thing that the Republicans love me so much. I can work with those guys. They have always been willing to listen to me and treat me fairly. Matthews: You know he isn't really a Democrat. He is a socialist. A SOCIALIST, I tell you! Hillary: I know, right? Just because he caucused with the Democrats in the Senate, supported every Democratic policy for all the years he has served, and publicly praised Barack Obama's policies including ObamaCare and closing the gun show loophole, he thinks that is enough to be able to give Democratic voters a choice to support him! Just sickening! Matthews: Well, best of luck, Madam President! You are a lock! Hillary: Thank you, Chris. The check is in the mail, er uh . . . I mean . . . uh just thanks! This interview was put on the air during the day time when MSNBC is trying to establish their straight news brand, in contrast to the Democratic leaning night time fare. I guess Bernie has another name to put on the establishment list: MSNBC. With all the sentiment in the country hating how the system is rigged against people who aren't in the establishment, this interview did nothing but provide a boost to Bernie Sander's campaign as well as to the ratings of CNN - well that is what it did for me, anyway.